My little monkey in the basement. He had a grand ole time running free down there. AHHHHH ... got back last night. Needless to say, I have several mounds of laundry and a meeelllllion things to get caught up on. It was pretty cold while we were there... we had a day or two of 10 to 20 degree weather. The wind made it kind of tough on the boys working on the cabin site. We (Mike, I should say) had a very productive 10 days! Our family cabin in coming along nicely. The load bearing wall in the basement is in place; the sub floor is up and it looks awesome; the excavator back filled around the cabin site; we now have a great burm along a much traveled county road that was put in, right along our property line (grrr) three years ago. I have some great pictures to post as soon as I have some more time. What a view, what a view, what a view we have. The pics just don't do it justice. Logs will be delivered this coming Friday. so, he has postponed the repair on his heart until we figure out who else he could go to that is acceptable. You know ... you don't want a "WalMart" doctor working on your heart... you'd like a "Macy's" doctor. I'm telling ya ... our healthcare system is just a wreck. I think it's rotten that the insurance companies can dictate where you can and can't go. By saying it's "out of network" they are pretty much saying you can't go b/c it's simply unaffordable for the average person ~ so, you are forced to go where they say. Back when Casey was growing up, I could go where ever I wanted ... now, there is all this "in network" "out of network" crap. Back then, only the HMO's had lists of places you could and couldn't go to, now it's the regular insurance companies. Trust me, before we ever go out of town, I'm on the phone, making sure hospitals in the area are "providers" for our insurance company. It just stinks. Poor Casey ... he's trying to get his masters degree, works full time and has a house payment on an average wage ... now, he could be facing monster medical expenses. Makes me want to cry for him. Welcome back. I will be heading North to Utah again next week. As far as our health care system, we have the best hospitals, we have the best doctor, as far as the administration of the system - well, it is broke - good luck with your kids. Families are forever. Have a fine Vegas evening. TLRB, you are correct ... I do think we have the best hopitals and docs in the world ... top notch no doubt. I still think nothing will bankrupt you faster than a medical issue. YOUR DAMNED IF YOU DON'T HAVE INSURANCE & DAMNED IF YOU DO. DO NOT KNOW THE ANSWER , BUT I KNOW IT'S NOT SOCIALIZED MEDICINE. 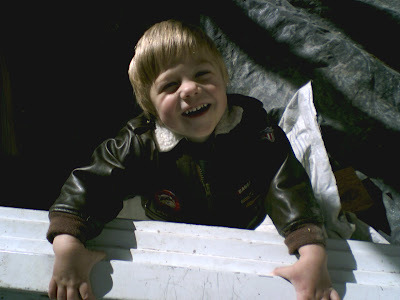 THAT WAS A CUTE PICTURE OF MY FAVORITE LITTLE BOY. DID HE GET OVER THE EPISODES CAUSED BY THE STEROIDS? Nice to see you back... and bummer about Casey's health care costs! I think I'm glad I don't live over there! I knew I woke up out of a sound sleep for a reason and the reason is to discover that you're baaaaacck!! I should have checked before I went to bed. It is because of problems like this that our local radio talk show guy did a segment about people going overseas to get the same surgeries cheaper. It really is frustrating, since there are no better places than in the USA. Heck, even Howard the PM of Australia came here for health care. It is a pity people are having to resort to foreign medicine. I hope you find good news on that front....soon! I hope everything works out for Casey. Because of issues like that, I pay a whole lot more to have Blue Cross. People tell me I'm wasting money, and I probably am, but there will come a day when I don't want to worry about going to a certain doctor or getting a referral, and it will be worth it then. Cute picture, by the way. checking out the docs and the medical center on "the list" ... but most of the main good hospitals in LV are not on the list ... that's just plain weird. He's with a huge insurance provider.